Sacred Alchemy Store was today on the 9th of April inaugurated on a time astrologically elected to gain favour from the stars, in this case from Venus, who also happens to be the planetary ruler of my nativity. The astrologer William Lilly (1602 – 81) says that Venus signifies a man not given to quarrel or wrangling, but is rather about the pleasantries of the world with ‘Loving Mirth in his words’. Venus owns several evergreens, such as myrtle and prefers greenwood of a sweet and pleasant scent. She is the Lilly, deadly and euphoric, it be of valley or water. Apples, roses and all sorts of sweet fruits like figs and apricots belong to her as does mugwort, walnuts and oranges. She is the hart, the Panther and the nightingale, swan and black coloured birds like the Pye. Venus rules gardens, fountains, waterfalls and bride chambers and any place and thing beautiful. She is red coral and lapis lazuli. But Venus is also the planet of concord and of increase, she is the constant reminder that our world is beautiful and that a little bitterness is necessary for us to realize her sweetness. It is about care and consideration; it is about favour and beauty in the absence of quarrel. It is about richness and about the element of transmutation – because Venus is certainly the Holy Dove that ignites spirit in what we do, so what we do in beauty can mirror truth. These are as such the virtues and starry dignities influencing the birth of Sacred Alchemy Store. The logo of the store was carefully developed in this very same spirit of concord and beauty we find in Ifá, where one verse in the corpus of odù ifá speaks of how goodness multiplies if we only reach out and touch the other with goodness. Hence we find two hands touching and simultaneously generating a sign of infinity as it points towards the source. The name was chose because the work done in relation to the store is of a sacred nature. In truth there is nothing profane in the world, lest our attitudes, and as such health and beauty of body, soul and mind is the ideal that is stirring the birth of this store. It is alchemical, not solely because of the alchemical process we associate with the laboratory, but because of the focus on transmutation and elevation on the tripartite constitution of the human being. 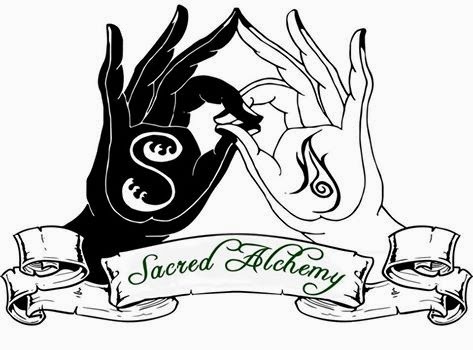 Alchemy is about introducing two or more components together to arrive to a refined product that captures the virtue of the introduced components into a new form and constitution and in this frame all services and products provided in Sacred Alchemy Store is brought forth on the tenants of alchemy. This is true as much as for our services as for our products. But, to get to the blood and bones of the matter, over the years a great number of people have contacted me about matters concerning Ifá, astrology, geomancy, Quimbanda, Palo Mayombe, Vodou and many other matters of soul, psyche and spirituality. It made me realize that I have been subject for the giving graces of Venus throughout my life but it also made me aware that a more direct channel was needed. And it is in succession of these giving graces this store has become manifest and it is because of this I offer this store as a bridge towards several mysteries of alchemical transmutation and personal fulfillment.